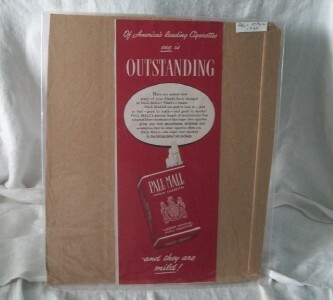 Pall Mall 1950 print ad " Americas Leading Cigarette"
". This original print ad measures approximately 5 1/2 x 13 1/2 inches. it will come in a plastic sleeve. There is a cardboard removeable backing to protect it. (white edges are cardbord boarders) Can be removed for framing. Over all good condition. Supersize photos to examine. **Some edges on some ads may need trimming depending on display used or as desired.